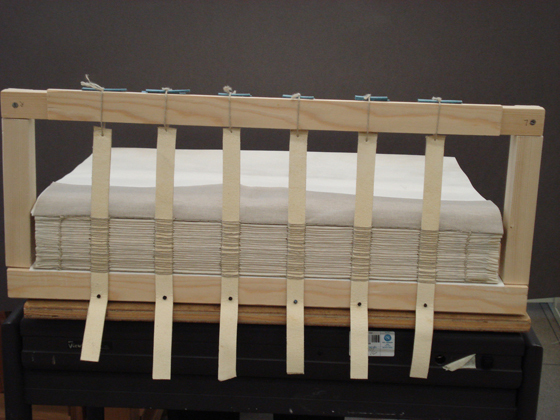 Many of us don’t fully appreciate the work that has to be done behind the scenes to ensure that manuscript books in exhibitions are presented in the best possible way. 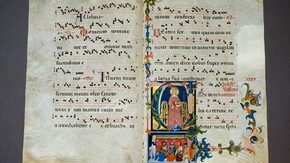 In the Victoria and Albert Museum, a choir book made in Tuscany, probably Florence, in around 1380 for a religious house of nuns is one such. 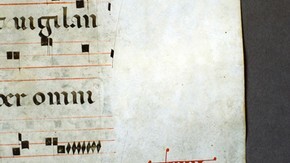 It contains the chants to be sung in the Masses for saints on their feast days. 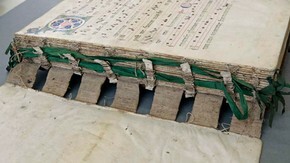 These choir books were usually large enough to be propped on a stand so that all the choristers could see the words and music at the same time. 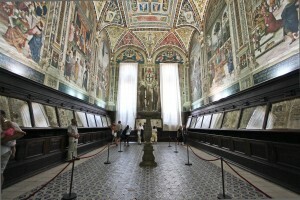 Many of them are quite huge, and there is a glorious collection of these books which can be seen by the public in the Piccolomini Library at the cathedral in Sienna, Italy. The V&A book, though, was not in a good state of repair. 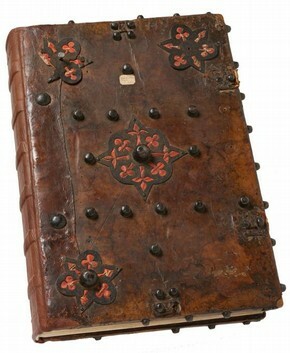 It had been stored upright rather than flat and this had put a strain on the binding such that the front cover and the first few quires were separated from the rest of the book. Handling the book was challenging without causing further damage. Also, the inside was in a sorry state. 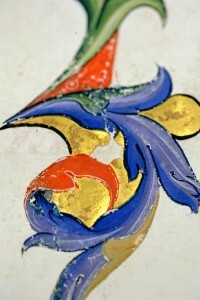 It was very dirty, and some of the pigments and gold leaf had started to detach. There is a large chunk of gold leaf that has fallen off in this illumination and the other areas of gold look damaged too. 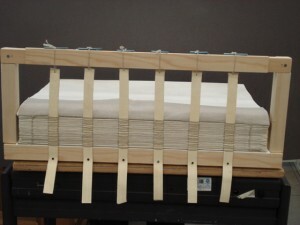 So the decision was made to completely rebind the book and also clean and consolidate the pigments. Most of the cleaning was done by using a soft eraser, although there was some use of a chemical sponge. The results can be seen here on the right and below. The pigments were also analysed and a whole range of colours including the precious lapis lazuli (ultramarine) and vermilion (cinnabar), as well as red lead (minium), lead white, (ceruse), azurite (citramarine) and organic pink (probably madder looking at the manuscript). The non-destructive tests on the ink were inconclusive, so it is not clear whether it was oak gall or carbon ink used. The book was rebound, including removing the metal bosses on the covers to enable the latter to be attached to a new spine. A series of photographs of this process is shown on the website page and it is a fascinating record of a true craft process. This entry was posted in Blog, Craft, Manuscripts and tagged books, illumination, ink, miniature, paint, pigment on 11 November 2013 by Patricia.